What would you get up at 4:30 AM for? I do like my sleep but one of the answers to that question for me would be hawksbill sea turtle tagging! We have been so busy down here running research cruises with Dominican school children and planning our time that 5 AM became the only time to make it happen. Once the epoxy dries we set the turtle free and what an exciting time that is. The two turtles we tagged were both fairly small so it will be interesting to see if they stick around the reef. The tags will let us know where they go and when. 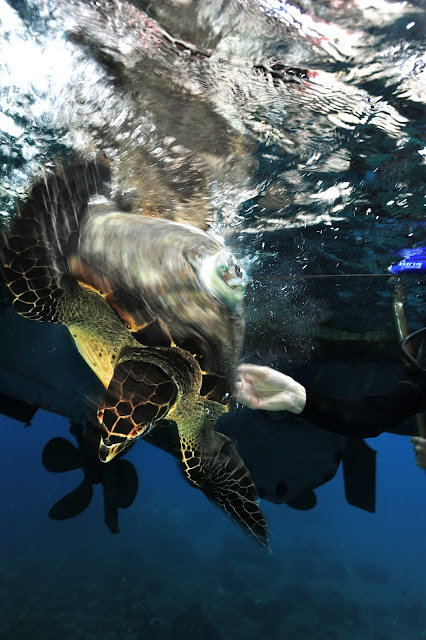 Sea turtles are tagged at the New England Aquarium as part of the Marine Animal Rescue Team. Learn more about that program here. You can track the sea turtles that the Aquarium has released here. I thought I was amazed before, but this is super fantastic! Nice job; gorgeous turtle. Stunning photos,Jake, as usual! I can't even imagine what will be next!